Where do you want future RVA Bike Share stations? Bike Walk RVA seeks to ensure that communities who want access to bike share can give their input to the City of Richmond so that the City and RVA Bike Share can do everything possible to reach them. Your voice is important! RVA Bike Share launched with 16 stations and 220 bikes in August of 2017, with 4 additional stations coming soon. Bike share is a low-cost bike transit system that allows customers to check bikes out from automated stations for short trips, and bikes can be checked back in at any station. The City of Richmond is working to identify locations for Phase II with a similar number of stations and bikes in new areas and in higher concentrations in currently served areas. We at Bike Walk RVA want to help the City understand where people in Richmond want to see access to the system expanded. Placement for bike share stations requires consideration of a number of factors, provided below from the City Department of Public Works. Given these factors and the fact the bike share system must be expanded in phases, service in every neighborhood can't be guaranteed. This survey will close February 28, 2018. * 1. Have you used RVA Bike Share yet? * 2. EXISTING - Phase I, the currently available bike share system, serves about 8 areas mostly clustered in and around the center of the city. If you could have more stations added in one of these areas, which is the most important to you? (Carver, Scott’s Addition, Downtown, VCU, Jackson Ward, Monroe Ward, Shockoe Slip, Uptown). Here's the existing station map. * 3. 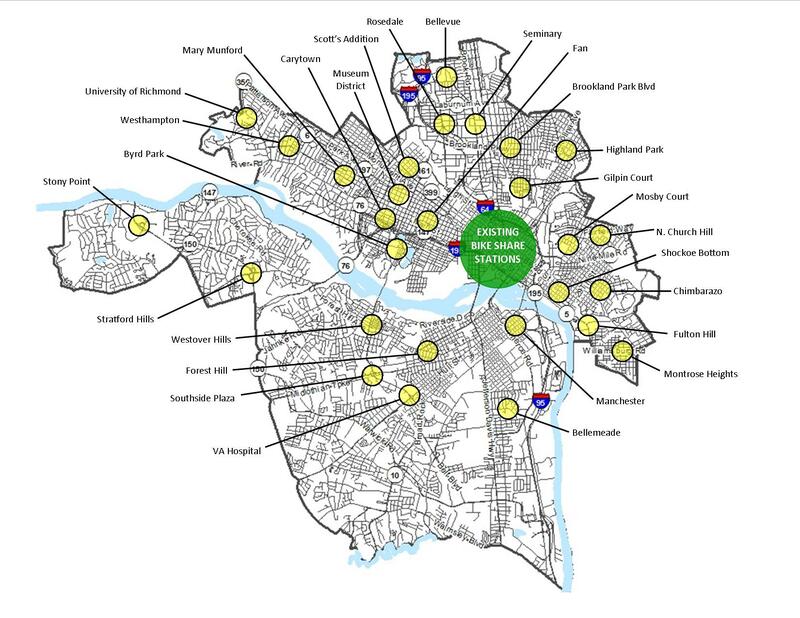 EXPANDING - Please select 5 neighborhoods in Richmond where you would like to access RVA Bike Share, focusing on areas with no current stations. This includes areas where you would start or finish a trip of any kind, including to school, work, home, shopping, leisure, and connections to and from bus stops. Here's a generalized map including each area for reference. * 4. Help us understand a little more about you. We will keep your personal information confidential! * 5. May we add you to our biking and walking email list? * 6. Optional question: Finding good sites for bike share stations can be challenging. They require a large footprint with public access and good visibility, and they need close access to electricity. If you have a suggestion for a specific station location (or multiple stations), please include detailed information about where and why it's a good choice.